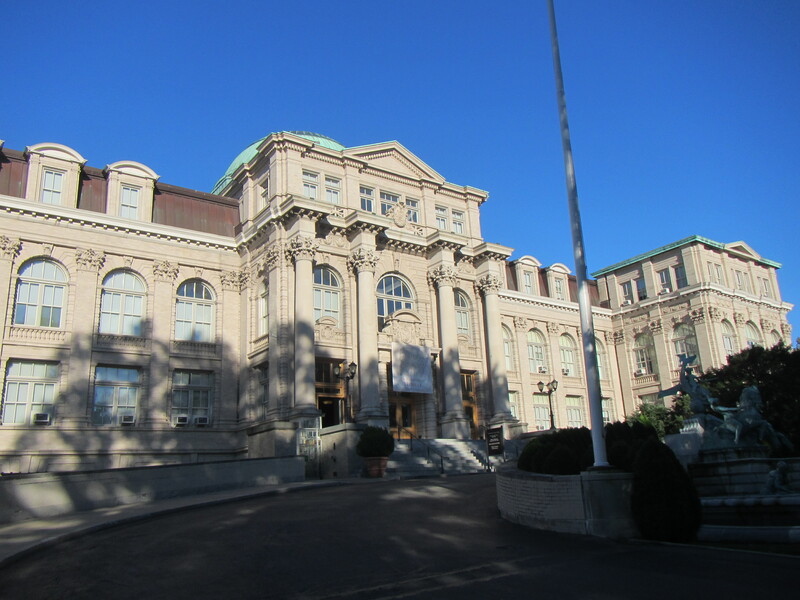 For years I have wanted to visit the New York Botanical Garden. On previous visits to New York City I have not been able to carve out enough time from my business commitments or I could not convince my friends that it was more interesting than say, the Statue of Liberty. At last, I was able to spend about 3 hours in this world class botanical garden. I could have spent all day. I entered at the Mosholu gate and proceeded to the nearest cafe. The view of the Conservatory from the terrace was breathtaking. I was overheated from my bike ride so I opted for the air-conditioned indoor dining. The chicken waldorf salad was satisfying and I poured over the garden map while I chewed. 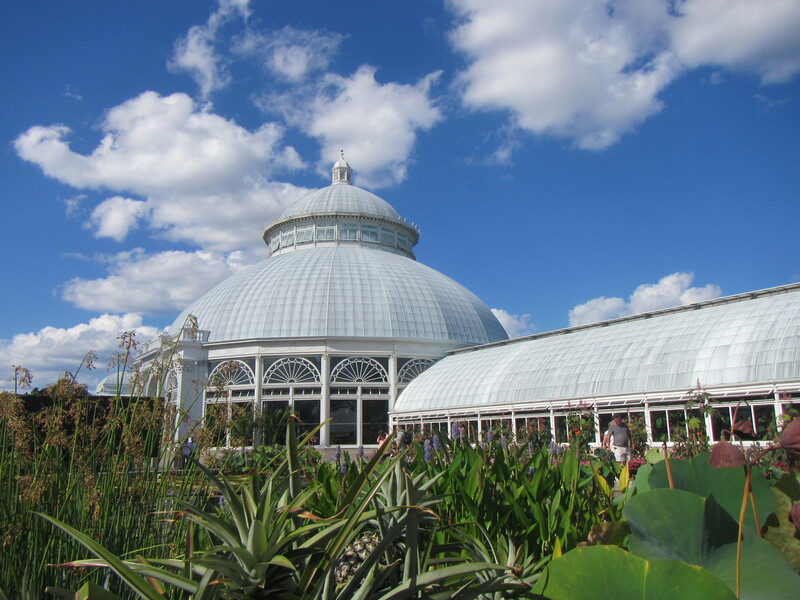 The challenge of NYBG is choosing how to spend your time because there is so much to see and do. In an ideal visit, I would have time to just sit and relax by the soothing lily pond. (How do they grow pineapples in large pots?) And wander through the native plant garden. Lily pond in Conservatory courtyard. A sure sign of the level of excellence of an institution is the quality of the staff and exhibits. NYBG manages to combine the best of both. I was lucky to visit on the last weekend of “Wild Medicine” in the Conservatory. The exhibits packed a lot of fascinating information in a readable, entertaining way. I was torn between reading every word and pressing on to see more of the Garden. 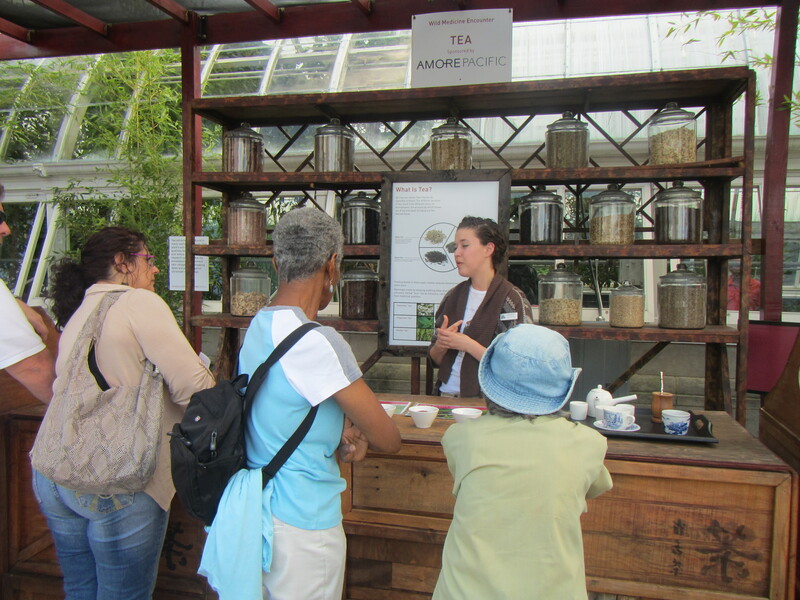 Then they took it to another level and offered interactive booths with very knowledgeable docents giving demonstrations on tea and chocolate with samples! Docent knew as much about tea as the best Napa winery pourer knows about wine! I kept moving because I had only scratched the surface of the Garden and it closes at 6 pm. I walked toward the visitor center and admired the mature plants. I have visited a number of botanical gardens and the younger gardens are at a disadvantage because a well cared for garden improves with age. NYBG has the added advantage that due to the foresight of the founders, they even have original forest from pre-development Bronx. Visitor Center has a second cafe and a terrific gift shop. Plus they take advantage of existing buildings like the Stone Mill. Even the more modern buildings are designed to complement the Garden. 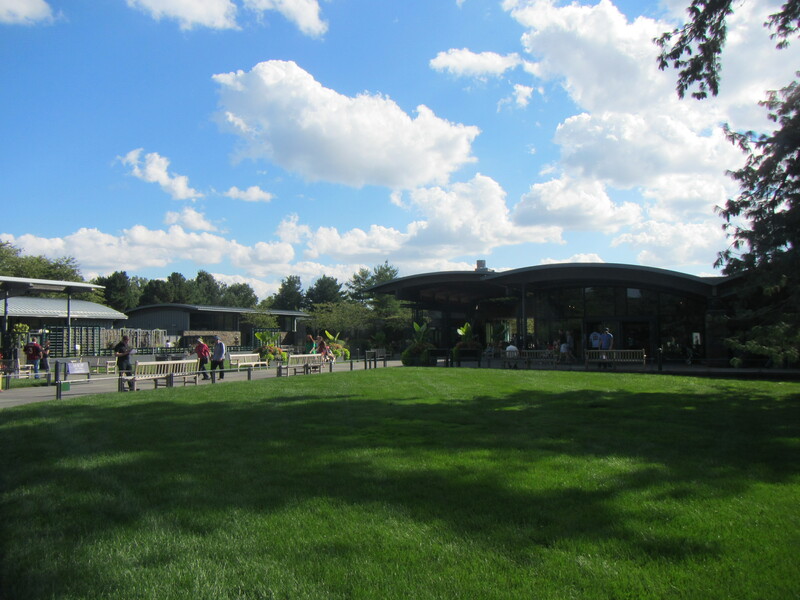 The impressive library, the gracious visitor center, and even the modern research center are all signs that the Garden is well supported by the community. With still so much to see, I hopped on the tram and rode it through the rest of the Garden. You can hop on and off, or stay on and get a windshield tour in about 30 minutes. 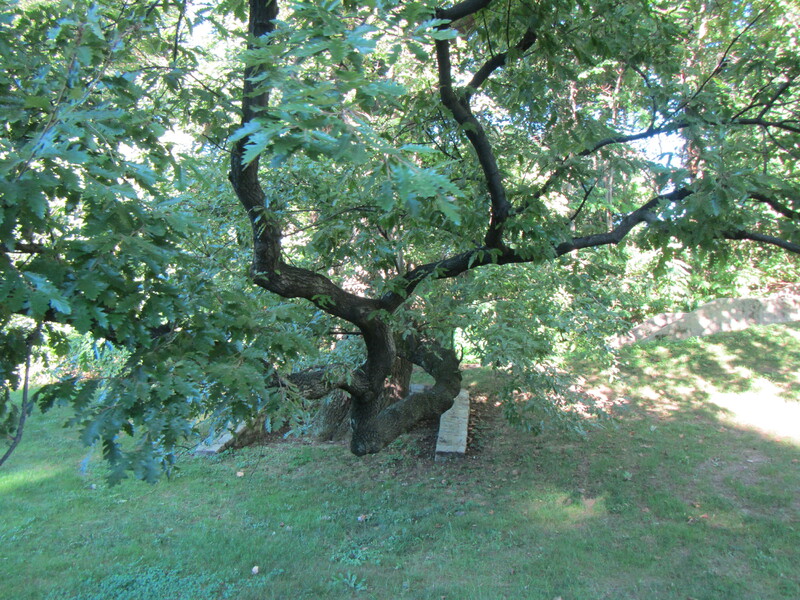 I am glad I did this or I would have missed my favorite plant in the garden–the Turkey Oak. Favorite tree in garden. Reminds me of the wonderful Moreton Bay Fig. My last stop before closing was at the Library. There are special films shown at designated times during the day along with special collections. My mouth dropped open at the beauty of the rotunda. I wished I had more time and promised myself that I would come back and spend the entire day. To think that at one point I thought I would visit both the Garden and the Bronx Zoo (nearby). Ha! Beautiful library–they do not build them like this anymore. 3. The interesting (although a little worn around edges) Cornerstone Gardens in Sonoma, California. 5. Michelle Obama’s vegetable garden at the White House and Martha Washington’s garden at Mount Vernon both in Washington, DC area. 6. Powerscourt Garden in Dublin, Ireland. Also has a tempting gift shop. 7. Bilbo Baggins’ garden at Hobbiton near Matamata, New Zealand. 8. Beatrix Potter’s Hill Top Farm in the Lake District, England. Honorable mention: whimsical garden at Belfast Castle–lovely memories of searching for all of the “cats” and the cut flowers at the University of Portland Farmers Market. And if I could go to any garden, real or imaginary I would go to Prince Charles’ garden at Highgrove, or the Secret Garden in Frances Hodgson Burnett’s imagination. And my wanderlust will someday take me to Versailles, Amsterdam Flower Mart/Show, the Philadelphia Flower Show, Longwood, and Victoria, British Columbia. Yes! Add it to my “Will see one day (soon)” list. 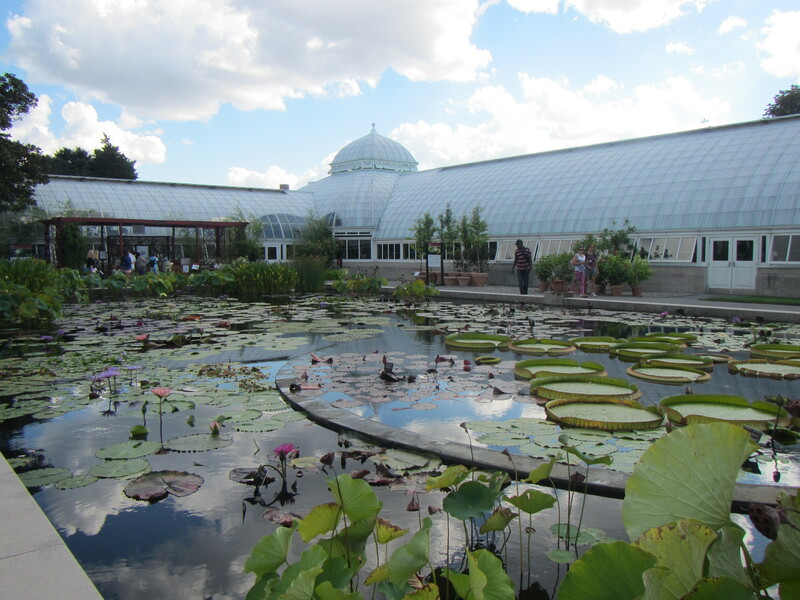 I recently wrote a travel blog on NYBG for senior visitors and wanted you to have a copy. Please share this site below and information with interested persons. Sorry, I never received a notice that you commented! My bad. I will take a look at your blog post.